Miami Trace Local Schools held a groundbreaking ceremony at the track and football field on Thursday morning to signal the start of work on a brand new high school to be completed in 2019. 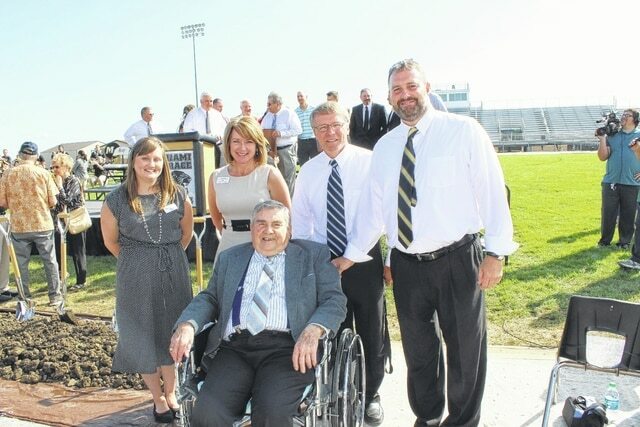 Pictured is Curtis E. Fleisher (middle), the record holder for longest service as the leader of the Miami Trace High School and its third principal. He was visiting from Court House Manor on North Glenn Avenue in Washington Court House and he enjoys regular visits from his wife Janet and his son David. He is pictured with Tiffany Cline, social worker at Court House and St. Catherine’s Manor; Julie Bolender, in charge of business development at Court House and St. Catherine’s Manor; Rob Enochs, current Miami Trace High School Principal and David Lewis, Miami Trace Superintendent. Months of effort culminated in a large groundbreaking ceremony Thursday for Miami Trace as the district prepares to build a new school for its high school students by 2019. The student body, faculty, guests, administration, school board and many others joined the Miami Trace Local School District for its groundbreaking ceremony at the track at the current high school Thursday morning. The event opened with the “fight song” performed by the Miami Trace High School Marching Band under the direction of Ken Hoffman. The Miami Trace Symphonic Choir, under the direction of Holly Stanley, also performed, welcoming the crowd with the National Anthem. Pastor Bruce Morrison led the invocation. Miami Trace Superintendent David Lewis opened with an introduction of various guests, including state representatives, local law enforcement, construction leaders and many others. He then introduced Miami Trace Board of Education President Dave Miller, who gave a few remarks. Miller continued by thanking the taxpayers in the community for their continued support and helping to make a central campus setting a reality for Miami Trace. He said that without their support they would not be celebrating this great opportunity. With an enthusiastic “Go Panthers,” Miller concluded and the groundbreaking portion of the ceremony began. Instead of administration, board members or construction representatives turning the dirt, two students from each grade, a boy and girl, were selected to represent the schools. Some of these students also helped to release 329 balloons, which represent the sum of the graduation years in the current student body, starting with 17 (for the class of 2017) and ending on 30 (for the class of 2030). The students assisting in the groundbreaking and balloon-launching were: Drake Ecton, Esmeralda Rodriguez Pena, Adailya Ridings, Braxton Harris, Alyvia Atkinson, Zane Carner, Tanner Eggleton, Anslee Combs, Jimmy Woodruff, Asucel Cruz, Konner May, Sue Morris, Jesse Daniels, Anna Williams, Pedro Arreguin, Jarya Hassell, Kamdon Satterfield, Katelyn Lewis, Madyson Adkins, J.J. Puckett, Abbigayle Pettit, James Munro, Wes Gandee, Destiny Peterson, Logan Graham and Faith Halloway. https://www.recordherald.com/wp-content/uploads/sites/27/2016/09/web1_IMG_0025.jpgMiami Trace Local Schools held a groundbreaking ceremony at the track and football field on Thursday morning to signal the start of work on a brand new high school to be completed in 2019. Pictured is Curtis E. Fleisher (middle), the record holder for longest service as the leader of the Miami Trace High School and its third principal. He was visiting from Court House Manor on North Glenn Avenue in Washington Court House and he enjoys regular visits from his wife Janet and his son David. He is pictured with Tiffany Cline, social worker at Court House and St. Catherine’s Manor; Julie Bolender, in charge of business development at Court House and St. Catherine’s Manor; Rob Enochs, current Miami Trace High School Principal and David Lewis, Miami Trace Superintendent.